It’s that air pollution blame game again. Less rain and stronger sunshine are the reasons given by the Environmental Protection Department for Hong Kong’s increased pollution levels during the first three months of the year. In recent years, we have also been told that dust clouds, climatic systems or factories in Guangdong are responsible. But let us be clear – it is us and no one else behind the bad air. A department spokesman said earlier this week as yet another batch of poor figures were released that dry weather meant pollutants would stay in the air longer. Less cloud cover caused solar radiation, which formed photochemical smog. These reasons may go a way to explaining why the air pollution index was at a “very high” level for about a third of the period. They do not answer the question of how the pollution got there in the first place, though. Meteorology is not required to answer it. It is caused by emissions from our vehicles, vessels and fossil fuel-burning power stations. Weather patterns can blow bad air our way, as last year, when dust from northern deserts choked our skies. In past decades, when Guangdong truly deserved the tag “factory of the world”, the polluted air from furnace smokestacks certainly did waft our way with the right conditions. At street level and for most of the time above our heads, though, the unhealthy air we breathe is our own making. There has been progress. Government rules, guidelines and incentives have meant a marked decrease in some pollutants. But others are rising. The quarterly figures show that levels of roadside nitrogen dioxide from vehicle emissions, which can cause respiratory problems like asthma and bronchitis, went up 21 per cent. No wonder air quality in areas where traffic is heaviest and most congested, Central, Causeway Bay and Mong Kok, was worst. We have got the ways and means to improve our air and make it safer. Laws and better standards will make all the difference. The existing voluntary schemes clearly do not work. Ignoring the causes and putting the blame on the weather is not a solution. Environment officials intend to track polluting taxis and cars using remote-sensing street-level technology. The plan – which aims to cut ozone and nitrogen filth – is being drafted by the Environmental Protection Department. The technology has been around for years but officials are now taking a serious look at it as the nature of air pollution changes. 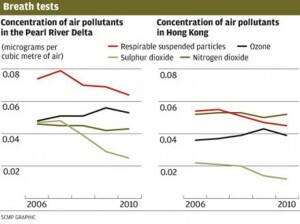 Since 2006, improvements have been achieved in the concentrations of respirable suspended particles and sulphur dioxide, thanks to the installation of sulphur scrubbers at major coal-fired power plants in the delta region, according to results from the 2010 regional air quality monitoring network, released yesterday. But no notable improvements were recorded for nitrogen dioxide, mostly attributed to vehicle emissions, or for ozone, a secondary pollutant formed by a chemical reaction among air pollutants. Since the monitoring network, with 13 stations in Guangdong and three in Hong Kong, came into operation five years ago, ozone in the air had risen 10 per cent. While sulphur dioxide and particulate levels had fallen 47 and 14 per cent, nitrogen dioxide went down by only 7 per cent. “The ozone might be a problem even beyond the region. 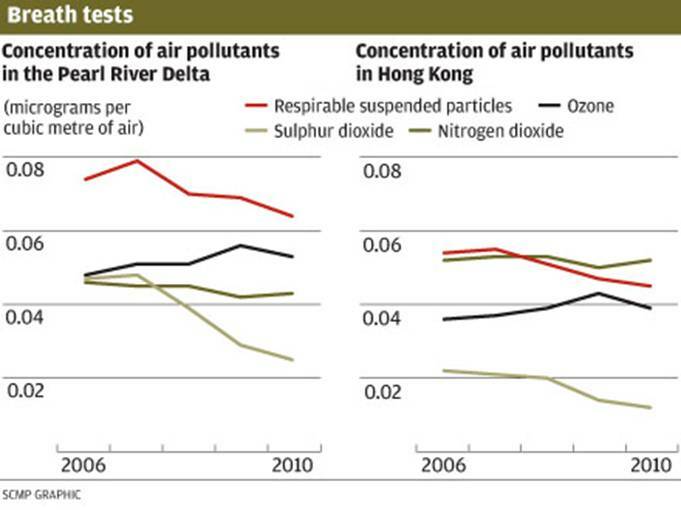 There is an increase of ozone outside the Pearl River Delta, too,” an official from the department said. He said the key to suppressing ozone formation was to lower the emission of its contributing pollutants – nitrogen dioxide and volatile organic compounds. Towards this end, the mainland seeks to cut 10 per cent of nitrogen pollution in its 12th five-year plan for 2011 to 2015. Locally, the official said, old franchised buses would be equipped with a pollution reduction device. A trial will begin later this year. For vehicles that run on petrol and liquified petroleum gas, the department was working out a plan to spot excessive emissions using the street-level sensor. The official said there was a need for different standards for vehicles of different ages, and to gather enough data to set up benchmarks. “We will do it as quickly as possible so that the trades and drivers could be consulted,” he said. Lifestyle-related diseases stemming from tobacco, alcohol and obesity, have taken over infectious diseases such as HIV and malaria to become the greatest killer of people worldwide. Director-General of the World Health Organisation Margaret Chan yesterday released a report that showed non-communicable illnesses including cancer, diabetes and heart disease had contributed to 36.1 million deaths in 2008 – nearly two thirds of the 57 million deaths around the globe that year. Speaking at a meeting in Moscow, Dr Chan said the rise of these diseases was an enormous challenge for affluent countries, but more so for low and middle-income countries that experienced 80 per cent of the 36.1 million deaths in 2008. ”For some countries, it is no exaggeration to describe the situation as an impending disaster; a disaster for health, for society, and most of all for national economies,” she said. However, Dr Chan stressed that the diseases were largely preventable and could be treated and controlled with the right medical interventions. She said millions of lives could be spared if governments adopted stronger anti-tobacco controls while promoting healthier diets, physical activity and less harmful consumption of alcohol. Without action, Dr Chan said the epidemic was projected to kill 52 million people annually by 2030. In Australia, the report said about 63,400 men and 63,200 women died in 2008 because of non-communicable diseases. About 40 per cent of the population did not exercise enough with 64 per cent deemed overweight or obese. It also noted that 17 per cent of Australians smoked daily, 36 per cent had high blood pressure and 9 per cent had high blood glucose levels. And in 2008, every Australian consumed about 10 litres of alcohol. Professor Rob Moodie from the Nossal Institute for Global Health at Melbourne University said Australia had a high burden of non-communicable diseases and needed to ramp up its efforts to reduce the incidence. He said although the Australian government had done well on anti-tobacco policies, it needed to limit the widespread availability of alcohol and increase pressure on the food industry to reduce the salt content of foods and advertising of unhealthy products to children. As the government continues to twiddle its thumbs over the noxious fumes that are spewed out by mainly buses and trucks, other organisations are thankfully taking a less relaxed view. Hung Wing-tat, an associate professor at Hong Kong Polytechnic University, is overseeing a pilot project to examine the health effects of air pollution in children. It is part of “The Clean Air Initiative for Asian Cities”, which was established in a 2001 joint plan by the Asian Development Bank, World Bank, and the US – an Asia environmental partnership. It works with Primary Four pupils in seven schools. The first stage looks at where the children spend their time – at school, home, walking in the street, buses, MTR and so on. Their pulmonary activity is measured, and then project workers follow selected children with devices to measure the same air that the children are exposed to. Professor Hung said preliminary results showed that children were being exposed to high levels of pollution. It also shows in some cases that the lungs of children are being harmfully affected. These pollutants include the so-called BTEX volatile organic compounds benzene, toluene, ethylbenzene and xylenes, which are found in petroleum derivatives. Despite being highly carcinogenic, the government monitoring stations do not measure them regularly – just nitrous oxide, particulates, sulphur dioxide and ozone. High levels of BTEX compounds were found in some schools and even school buses, and there were also high levels of nitrous oxide on buses, a result of insufficient ventilation, Hung said. He said a full study would take three years, but he needed funding. Practically all of the pollution we experience at street level in urban locations is generated in Hong Kong by traffic – 80 per cent by buses and trucks. The government can dramatically improve this problem probably for less than the HK$36 billion it mindlessly gave away to people in the budget. People who queued to buy a dehumidifier in anticipation of a foggy, humid spring should probably have bought an air purifier instead. The year’s first quarter has been unusually bright and dry and scientists are looking into the possibility that this is why the air was also unusually dirty. 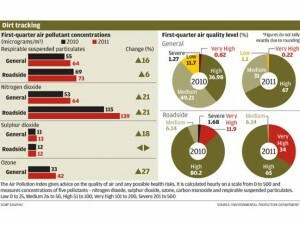 This spring has been one of the most polluted on record, especially on the roadside. The air pollution index was at a very high level for about a third of the January-March period, almost three times longer than during the same period last year when dust from a mainland sandstorm hit the city. Air quality was worst in Central, where 912 hours of very high readings were registered in the quarter. This was followed by 808 hours in Causeway Bay and 488 in Mong Kok. A very high level reading of 100 or more means at least one of the air pollutants being monitored has surpassed the air quality objectives set by the Environmental Protection Department in 1987. Exposure to bad air pollution can cause or aggravate respiratory problems or heart disease. Another indicator of air pollution, reduced visibility, also set record highs in the first quarter. The number of hours with visibility falling to below 8 kilometres, excluding days with high humidity and fog, surged to 190 and 207 hours in February and March, the highest ever for each of the two months, according to the Hong Kong Observatory. Figures for pollutant concentrations, separate from the air pollution index, show roadside nitrogen dioxide levels surged by 21 per cent. But Professor Alexis Lau Kai-hon, an atmospheric scientist from the University of Science and Technology, said vehicle emissions should take most of the blame. Professor Wong Tao, a Polytechnic University air pollution specialist, said the weather, still dominated more by air from the north than that from the ocean in the south, definitely contributed to poor air quality. But he believed more vehicle use in the improving economy and poor air circulation in a city dominated by high-rise buildings were also factors in pushing up roadside pollution. “Although it is officially spring now, the weather actually looks like autumn where it is drier and cooler. The lack of rain also meant that pollutants in the air could not be washed to the ground,” he said. Observatory figures show last month was the driest March ever, with rainfall about a third of normal. Professor Johnny Chan Chung-leung, a veteran weather scientist at City University’s school of energy and environment, also believes the unusual weather had something to do with the pollution. “I don’t think there has been a substantial increase in emissions so meteorological conditions might be at play,” he said. Chan said weaker northerly winds might not be conducive to dispersion of air pollution, while the cooler-than-usual weather might create more frequent inversion layers – warm air above cool air – that also block dispersion of pollutants. A spokesman for the department said changes in air quality should be measured on a long-term basis, and pollutant concentrations were more reliable indicators than number of hours at an air pollution index level. From 1999 to last year, the concentration of respirable suspended particles fell by 34 per cent and sulphur dioxide by 63 per cent. But nitrogen dioxide surged by 18 per cent in the same period. Those few words tell us a lot about how the government thinks. They scream out that the government cares more about building a bridge than about the quality of air you and your children breathe. Why else would Cheng find it regrettable that an elderly and ailing woman challenged in court the adequacy of the government’s study on what environmental damage the bridge would cause? Chu Yee-wah, a 65-year-old retiree who lives in Tung Chung, is worried the bridge, with its heavy traffic, would worsen her diabetes and heart condition. But Cheng showed no sympathy for the woman, only disappointment that the bridge could be delayed, adding to the construction cost. Her rebuke of Chu’s legal action was the government’s way of telling us it sees the bridge as more important than the damage it could cause to our health. It is instructive to note that it was the transport minister who reacted to the court ruling, not the environment minister. That again tells us where this government’s priorities lie. Cheng’s job is to make sure Hong Kong’s transport infrastructure functions smoothly, not only for residents but for business. Environment Secretary Edward Yau Tang-wah’s job is to safeguard Hong Kong’s environment. But he was mute when the court found the government had not done enough to safeguard the environment from the bridge. His role became subordinate to Cheng, who was not pleased that the lawsuit had hurt an important part of our transport infrastructure to facilitate trade with the mainland. Shouldn’t Yau be defending Chu? All Chu did, after all, was to allege the government had done an incomplete job in assessing the environmental impact of the bridge. The court agreed. It faulted the government for studying only what the air quality would be like with the bridge in place. It said the government should also have studied what the air quality would be like without it. Surely, this makes sense. But the government argues its duty is only to see if air quality is still within the standard it has set with the bridge in place. That is not safeguarding air quality. It is allowing air quality to worsen to the government’s much criticised and outdated standard. Instead of mulling over an appeal, which the government is doing, Yau should thank Chu for helping him do his job. Her legal challenge exposed a serious flaw in how the government decides if a development project damages the environment. It also shows that the government’s obsession with aiding the business sector – the bridge further opens the Pearl River Delta region – comes at the expense of the public’s health. It doesn’t have to be that way. A government that claims to care about the environment should feel obliged to compare air quality with and without the bridge before rushing to conclude the project can proceed. That is the honest and right thing to do. It doesn’t mean we must give up the bridge even if an honest investigation shows that having it would make air quality far worse than now. It simply means we must find ways to have the bridge without significantly worsening air quality. There is no reason why we can’t have our cake and eat it too. But that requires a sea change in the way our bureaucrats think. If they don’t believe people should come before things that aid business, they can at least treat the two as equally important. But do you see anything that says our bureaucrats put people first? Do you see parks instead of shopping malls, harbourfront walks instead of flyovers, historical buildings instead of skyscrapers? In response to Michael Lewis’s letter (“Draw up delta refuse strategy”, April 5), it has been the general approach internationally for individual jurisdictions to properly treat and dispose of their waste at the place of generation. That is, each jurisdiction should have its own means to manage the waste it generates, including household waste. Trans-boundary movement and disposal of waste collected from households in the international arena is subject to the Basel Convention, which requires the prior consent of the importing jurisdiction before the trans-boundary movement of waste can take effect. China is a signatory to the Basel Convention, which is also applied to Hong Kong. Both the mainland and Hong Kong authorities have implemented the Basel requirements through national and local legislation, respectively. Under the national law of China, the import of any waste for disposal is prohibited. The prohibition applies to Hong Kong under the “one country, two systems” structure. On the Hong Kong side, export of household waste is subject to control of the Waste Disposal Ordinance, Cap. 354, which limits the control authority from permitting the export of such waste unless the importing jurisdiction gives consent. In other words, under the existing laws of the mainland and Hong Kong, the export of household waste from Hong Kong to the mainland for disposal is not permitted. That said, the Hong Kong Environmental Protection Department has been exploring the possibilities for cross-boundary recycling of reusable materials with the Guangdong Environmental Protection Department under the purview of the Hong Kong/Guangdong Environmental Co-operation Agreement. This is with a view to reducing the pressure on our limited landfill capacity and improving the resource utilisation of the Pearl River Delta region. A controversial report on the environmental impact of a planned waste incinerator was given the green light yesterday by government environment advisers. The study was approved by the Advisory Council on the Environment amid charges by the plan’s opponents of irregularities in the way it was conducted. Council chairman Professor Paul Lam Kwan-sing said members were generally satisfied with the officials’ explanation of the way they had carried out the impact assessment. “So far, the government has not made any decision [as to where to build an incinerator] and that the council will certainly discuss it again when a decision is made,” he said. At the centre of the issue is the environmental assessment impact report on the first phase of the “development of integrated waste management facilities” – that is, waste incinerator(s) – to dispose of municipal solid waste. Departing from the usual practice of studying the best development site identified, the incinerator study covers two sites – Tuen Mun and Shek Kwu Chau – and also incorporates an option of having an incinerator in each of the two places in the later stage of the study. “The proposed project will be located at the Middle Tsang Tsui Ash Lagoon in Tuen Mun and/or an artificial island near Shek Kwu Chau with a size of about 11 hectares,” according to the study cited in the council meeting yesterday. But council member Edwin Lau Che-feng, who is also director of Friends of the Earth, questioned the way the study was conducted. “It will unavoidably give people an impression that the government might have some hidden agenda, that is, to build two incinerators instead of one,” said Lau. Opponents of the planned waste incinerator may have been handed crucial ammunition by the discovery of possible irregularities in the way the environmental impact assessment for the project was handled. Environment advisers say the Environmental Protection Department could face a judicial review over the alleged mishandling, and have raised the possibility of conflict of interest by the department chief. The issue involves the failure of department director Anissa Wong Sean-yee to spell out clearly how many incinerators the government wanted when she initiated the statutory environmental impact assessment (EIA) process three years ago. The public was initially consulted on alternative sites at Tsang Tsui in Tuen Mun and on Shek Kwu Chau off Lantau. But when the assessment study report was released it included a third option of building one at both places which had been added later at the department’s request. It turned out the government had asked the study consultant to look at the third option after the initial public consultation ended in 2008. Members of the Advisory Council on the Environment have complained privately about what they see as officials’ abuse of the assessment process and intense debate is likely when they meet today to discuss whether to endorse the study report. Former environment adviser Dr Ng Cho-nam said that while it was not uncommon to enrich an assessment study with additional data, it should not fundamentally alter the original objectives of the study. “This is a flaw in the EIA process as there is no way the director could avoid conflict of interest if the EPD itself is the project proponent,” he said. Ng said the director might risk a judicial review over the “improper handling” of the process. Council members have been told not to talk to the media about their previous discussions of the report. But one member, speaking anonymously, suggested Wong should delete the additional option. “It seems the overcooked EIA report should not be endorsed in full,” he said. Yung Chi-ming, chairman of Cheung Chau Rural Committee, which is leading a campaign to oppose the Shek Kwu Chau option, said they would exhaust all possible means in their fight. “If there is really a case, we will consider the possibility of legal action,” he said. The Environmental Protection Department insisted the director considered the process in line with the legal requirements. But in another twist it said the “project proponent” – the department – had consulted the Environmental Impact Assessment Ordinance (EIAO) authority on whether a new study brief was needed to study the “coexistence scenario”. The authority is Wong herself. The study consultant concluded that all three options were acceptable but refrained from recommending one that would have the least impact. It emerged later that the department favoured Shek Kwu Chau on grounds not totally related to the environment, such as tourism potential, even though it meant two more years of building and destruction of marine habitat by reclamation. Further inquiries to the department found that it could build a 3,000-tonne incinerator on each site and would not need a second impact assessment to do so provided the first study report was backed by the council and approved by the director. A review of past public documents by the South China Morning Post (SEHK: 0583, announcements, news)showed the department had never stated it intended to build two incinerators. As the project proponent of the waste incinerator, the department filed a project profile to itself in March 2008, initiating the statutory assessment process for an incinerator with capacity of 3,000 tonnes a day at Tsang Tsui or on Shek Kwu Chau. As required by the law, the public were given two weeks to comment. In May that year Wong issued her department a study brief outlining the objectives, scope and requirements of the assessment but still did not mention the possibility of two incinerators. An EIA study brief is an important set of parameters that both the director and the council rely on to assess if a study report meets the minimum legal requirements. In response to inquiries from the Post, a spokeswoman for the department said the director instructed the consultant to study the coexistence scenario in November last year. This was done after a review of the city’s waste management strategy that was derailed by lawmakers’ repealing in October a chief executive’s order to turn part of Clear Water Bay Country Park into landfill. “In accordance with requirements of the EIA study brief, the project proponent sought advice from the EIAO authority in October 2010 on the need for a new study brief,” said the spokeswoman, who clarified later that the authority was the director. This was the first public explanation of how the two-incinerator option came into being. But the council and the public were never consulted over the need for the additional study, which raised questions about whether the director had violated the spirit of public participation enshrined in the ordinance. Some members of the council’s EIA subcommittee also said they were troubled by inclusion of the third option as well as their lack of power to select the incinerator site. At a meeting on March 18 the members were specifically reminded by officials that they had no power to pick the site of the incinerator and their only option was to support or oppose the whole report. All members were also told not to talk to the media about what was discussed in the closed-door session. But one member questioned whether it was legal for the coexistence scenario to be endorsed if it was not part of the original study brief. 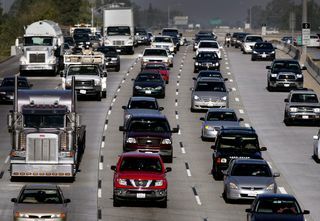 It is well known that air pollution from cars and trucks on Southern California freeways — a combination of soot, pavement dust and other toxic substances — can cause respiratory disease, heart attacks, cancer and premature death. Now, exposure to pollution particles roughly one-thousandth the width of a human hair has been linked to brain damage in mice, including signs associated with memory loss and Alzheimer’s disease, according to a USC study in the journal Environmental Health Perspectives. The study relied on a unique technology developed at USC for collecting particulates in a liquid suspension and recreating air laden with freeway particulate matter in the laboratory, which enabled scientists to conduct controlled experiments on cultured brain cells and live animals. How can we protect the millions of people who live alongside freeways from this type of toxicity? “So limiting one’s exposure — especially children’s exposure — to freeway pollution is essential to control asthma, cardiovascular conditions and cognitive development,” Morgan said. The study was prompted by earlier research by a separate group in Mexico that noted significant differences in brain samples collected from children and young-adult accident victims in smog-laden Mexico City compared with those in Veracruz, which has cleaner air. The brain tissue collected in Mexico City showed more extensive inflammation, oxidized DNA and other pathological markers of Alzheimer’s disease, Morgan said.